A luxurious river stone color mens stingray wallet emphasizing the unique natural patterns. This sting ray wallet has been sanded smooth highlighting it’s natural texture. 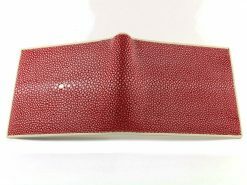 These skins are also sometimes referred to as shagreen from the French word “chagrin”. We’ve added a contrasting calfskin interior making this mens stingray wallet a one of a kind. Stingray has a long history of uses stretching back as far as ancient Egypt. In the times of the Japanese Samurai it was commonly used in armor and for the hilts of swords and knives. Later still it was featured as a covering for boxes and furniture in Europe. 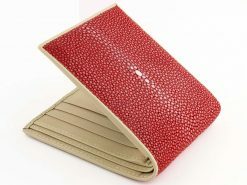 A remarkable material which makes for an incredible wallet, this one is a unisex wallet for both men and women. I just recieved my stingray skin wallet. This is excellent quality for the price. It took a little long to ship to US.